“Go beyond the mind and let the heart take over, be courageous and let your true voice speak. Observe how your Outer Galaxy shifts when you decide to change your Inner Starscape. Know deeply that there is more out there and that there is strength in you, for you are here, for a reason. 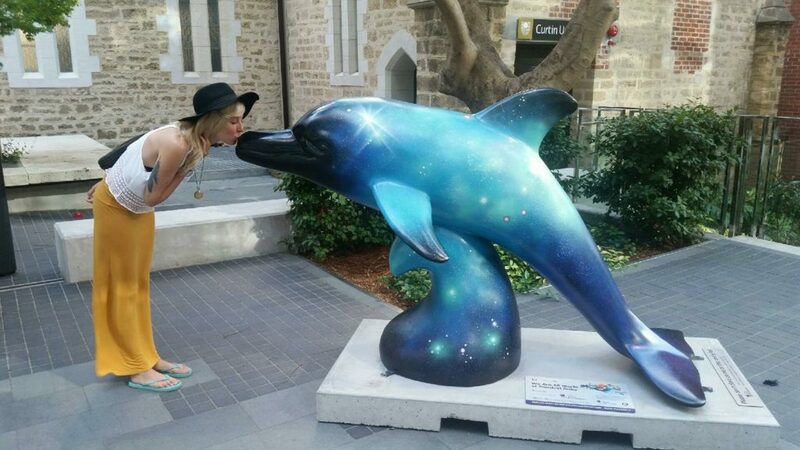 35 giant vibrant dolphins are currently scattered across Perth city from the 20th of January until 4th of March. 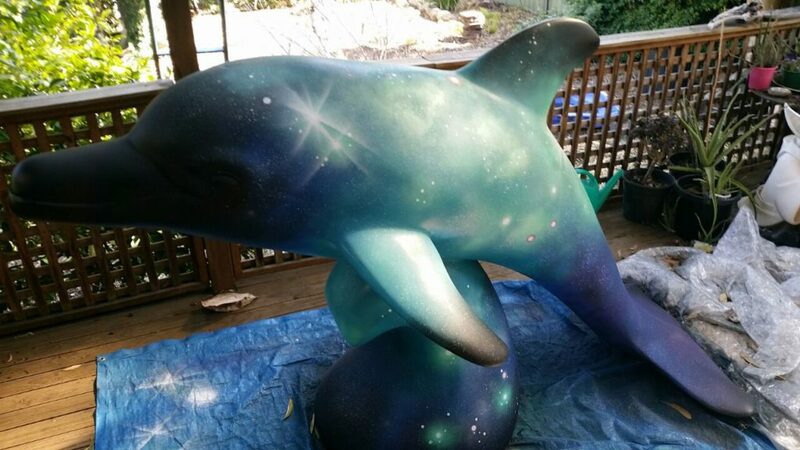 These wonderful fibreglass dolphins have been painted, richly decorated with mosaic or adorned with delicious textures by some of Perth’s creative minds. When you stroll around beautiful Perth this summer, you will find all these wonderful creations, vibrantly flourishing in the eyes of young and old. 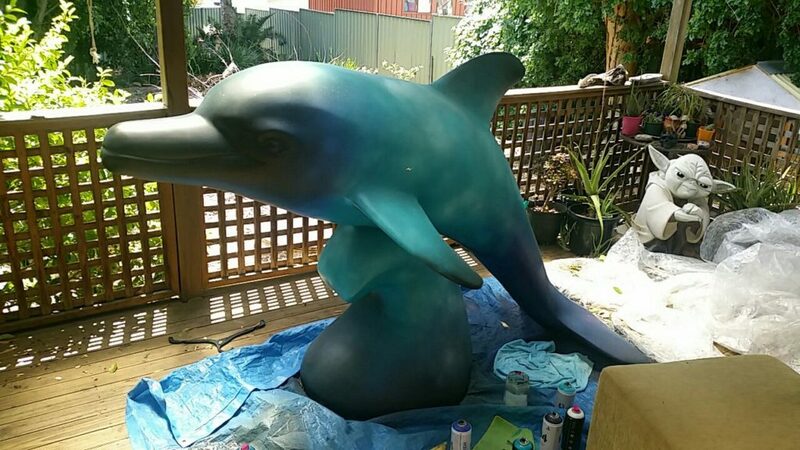 A few months ago I was selected to paint a giant dolphin for The Big Splash after submitting my design online. You can read more about it here. With your phone, you can scan each individual dolphin for a bit of insight into the mind of the creator. It’s really juicy, heartwarming stuff, especially when you consider the message and common thread of raising awareness of mental health challenges in youth and children. Being used to painting with acrylics on either wood, canvas or smaller objects, I had never painted anything this scale before! Each dolphin is 2 meters long and 1.3 meters tall. Spray paints were the answer for me, it just made sense. All the spray paints were purchased from Cloud9 and I couldn’t have asked for better service. I went in as a bit of a newbie when it comes to the spray can, so colour matching was my biggest fear. Painting a galaxy scape and really making it POP was to me, my biggest challenge. The last thing I wanted, was my piece to look ‘flat’. When I went to Cloud9 in Armadale, I showed the manager some sample pictures of what I was trying to achieve. Within seconds after a quick glance, she pulled out several cans from the back shelf without hesitation. She knew her stuff! I was impressed! She was even able to point out other colours within the reference image that I didn’t initially see. It was those unique colours that made me able to pull it off! Finally, here it is, the final masterpiece! 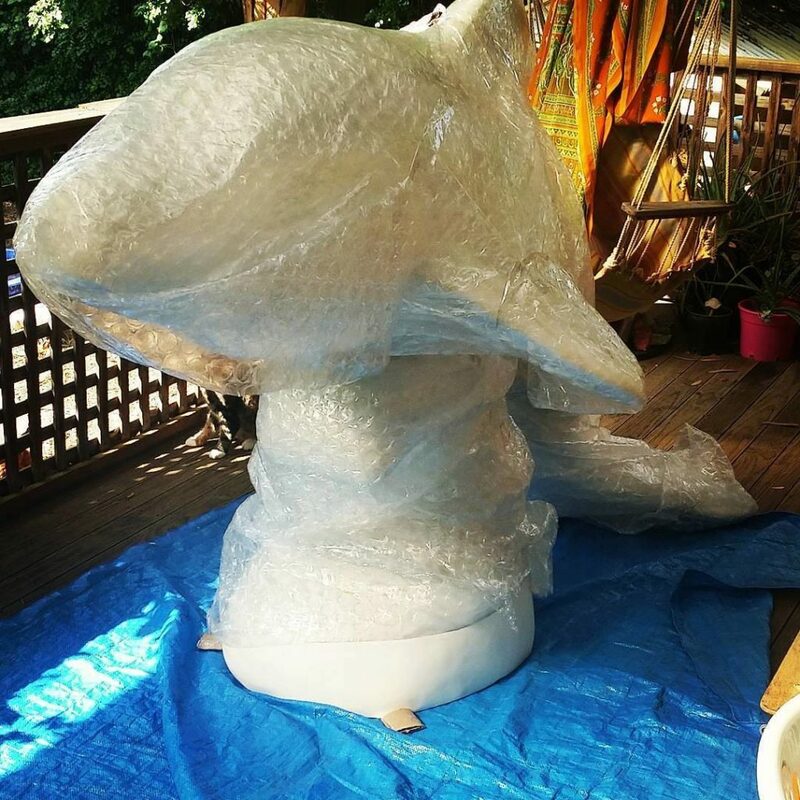 This shot was taken before I lugged this huge beast onto the trailer, completely swallowed in bubble wrap, with the help of my brother Martin, my young 6 yr old nephew KJ and my awesome dad. Not a big fan of giving explanations for my art, I usually find that the story is within the eye of the viewer, it’s more natural that way. What do you see? I dedicate this piece to my beautiful brother, Martin. To you reading this, follow your bliss, shine brightly and don’t let anything or anyone hold you back from living your life the way you feel life should be lived! Grateful for this amazing opportunity to be a part of The Big Splash and such a wonderful cause.